If you know what type of cheese to buy and how much you need, putting together a cheese platter for a party is a simple and fun task. Before you head to the cheese shop, read on to find the answers to many of the questions you may have about buying cheese for a platter. How Many Different Types of Cheese Should I Buy? Serving 3-6 types of cheese ensures an interesting selection that won't overwhelm or overstuff your guests. Or, if you want to keep things simple and make a stunning visual impact, consider serving a very large piece of just one type of cheese. You can serve a large wedge of cheese (like Parmigiano-Reggiano or English Cheddar) or even a half or whole wheel of cheese (like Drunken Goat or Brillat Savarin) When you're serving only one type of cheese, make sure it is full-flavored and perfectly ripe - a good cheese shop will help you pick out something amazing. As a general guideline when you're serving several different types of cheese, assume that each guest will eat between 1 - 2 ounces of each cheese that is served. More specifically, if you are serving other types of food (like a buffet or potluck) or the cheese is being served as dessert at the end of a meal, you can assume between 1 - 1 1/2 ounces of each cheese per person. If you're serving a cheese platter as the main hors d'oeuvre, you're likely to need at least 2 ounces of each cheese per person. 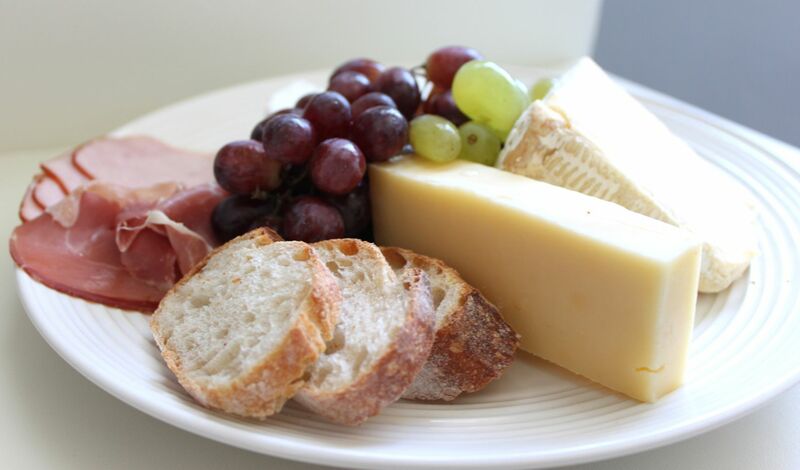 Example: 1 pound has 16 ounces, so for a party of 10 people where the cheese platter is the main hors d'oeuvre, you should consider buying 1.25 pounds (20 ounces) of each type of cheese. Serve plenty of bread and crackers and other garnishes so guests have other things to fill up on and you can get away with serving less cheese. What Types of Cheese Should I Buy? When you're buying cheese for a cheese platter, think about making each cheese different from the others in some way. Texture and flavor are the two big things to consider. For example, serving three hard cheeses is less interesting than serving one hard cheese (pecorino), one semi-soft cheese (Quadrello di Bufala) and one really soft cheese (Camembert). Similarly, serving three types of cheese that have very different flavors (such as a blue cheese, a triple cream cheese and an aged cheese) is much more interesting than serving three types of cheese that taste pretty much the same. One easy way to avoid buying cheese that tastes too similar is to select cheeses that are each made from a different type of milk. Serve at least one goats' milk cheese, one sheep's milk and one cows' milk cheese. Do I Want the Cheese to Have a Theme?